In case you haven’t seen it, the facade upgrade on One Hanover Square is finished. The columns from the previous build were removed and the outdoor space feels much larger. It gives City Plaza a modern feel as it more matches the renovations that took place to the plaza, especially the light towers. 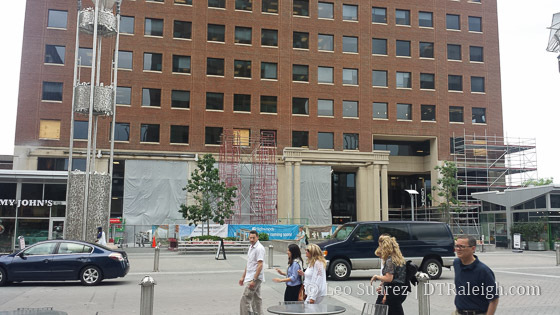 Bank of America Plaza is currently renovating their lobby and the facade facing City Plaza. 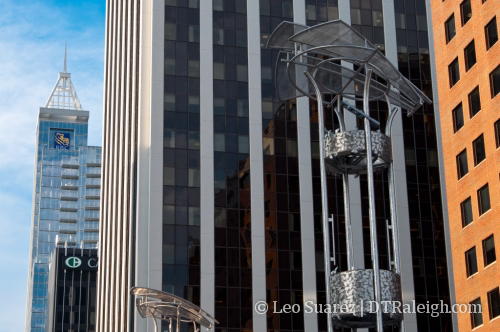 On October 24th, 2009, City Plaza was officially opened during Raleigh Wide Open 4. The open space towards the southern end of Fayetteville Street was called downtown Raleigh’s living room and for one year today it has served a unique purpose for downtown. 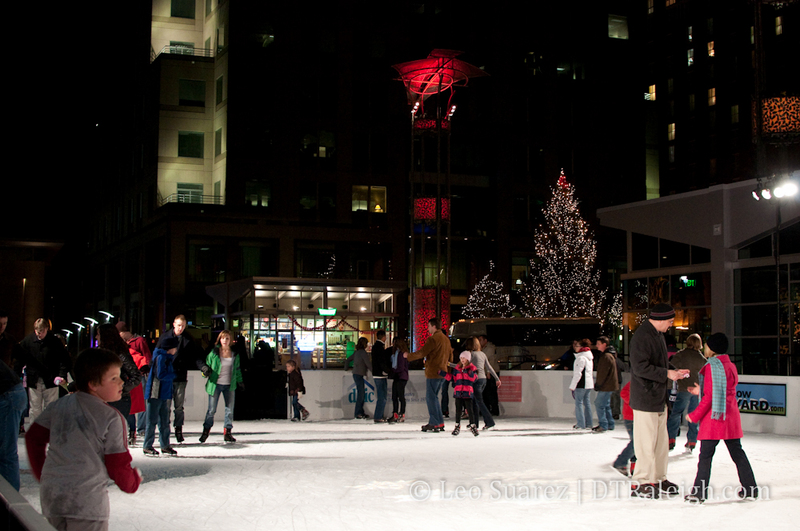 City Plaza has hosted a plethora of events from music and art festivals to the downtown Farmer’s Market and Winterfest. 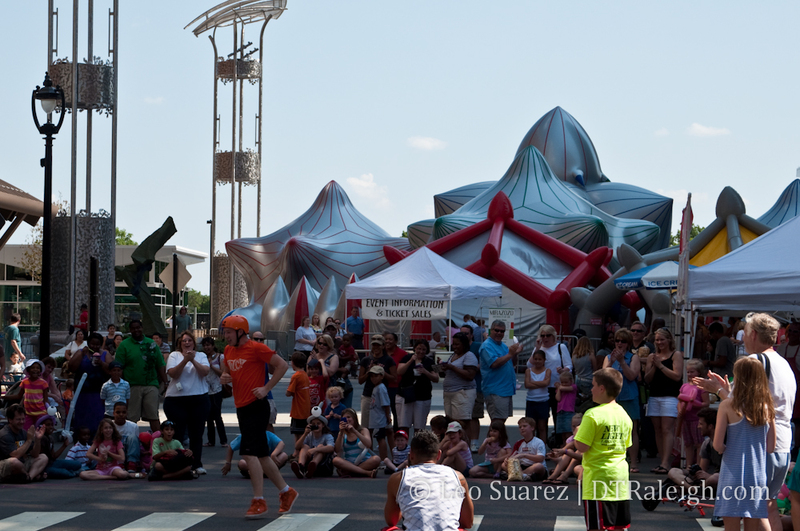 The plaza is a great gathering place in the core of the city and with the scenic Fayetteville Street view, it’s one of the best places to host an event in an urban area. City Plaza is also about the pedestrian first. 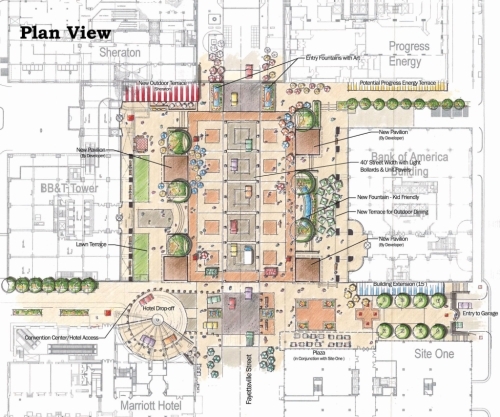 The plaza has fluid interaction with cars and people because of the flush street and sidewalks. It is easier to move around when on foot because there are no curbs, signs, or parked cars in the space. The fountain, the numerous tables and chairs, and lots of seating around the planted bushes and flowers makes it very inviting, open, and uncrowded. The pavilions in the plaza also make it a destination. The four shops have been open for some time now and soon a fifth will open in the One Bank of America Plaza tower. City Plaza is one of the most urban places in the city. here’s to many more years of hanging out there! 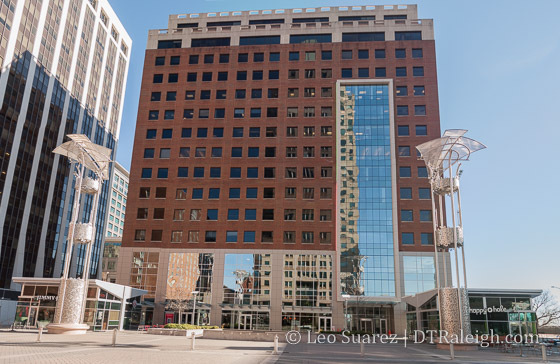 Formerly located at Moore Square, the Raleigh Downtown Farmers Market is a vibrant new addition to City Plaza and is downtown Raleigh’s premier venue for locally grown produce and artisan food. Parking Available At City Plaza? I took this picture on Saturday while walking on Fayetteville Street and enjoying the great weather. Cars were parking on City Plaza! The plaza had a little activity that day because of the Home Show that was at the Raleigh Convention Center. Also, the Krispy Kreme was getting some good business and customers were sitting outside on the plaza or playing with the interactive fountain. 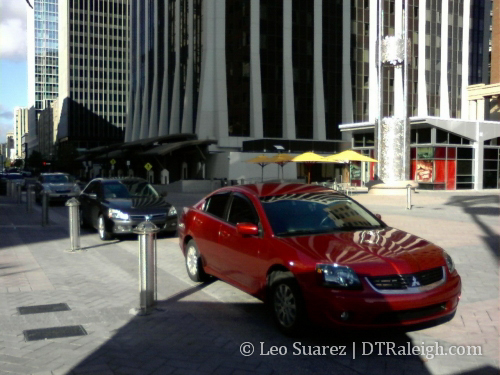 I’m a big fan of City Plaza and would like to see more urban spaces like it for pedestrians as downtown Raleigh grows. But the fact that cars were parking on this block irked me a little. This should be a space for pedestrians, not cars. I people watched a little while sitting at one of the several tables that have been put out on the plaza for anyone to use. I guess you could say I was car watching as well. Some cars slowed as if confused, figuring out if they could park here or not. Others parked for two minutes as they ran into Krispy Kreme for a coffee then drove off. Some were there longer then my thirty or so minute stay so its possible they used the spots for long term parking. 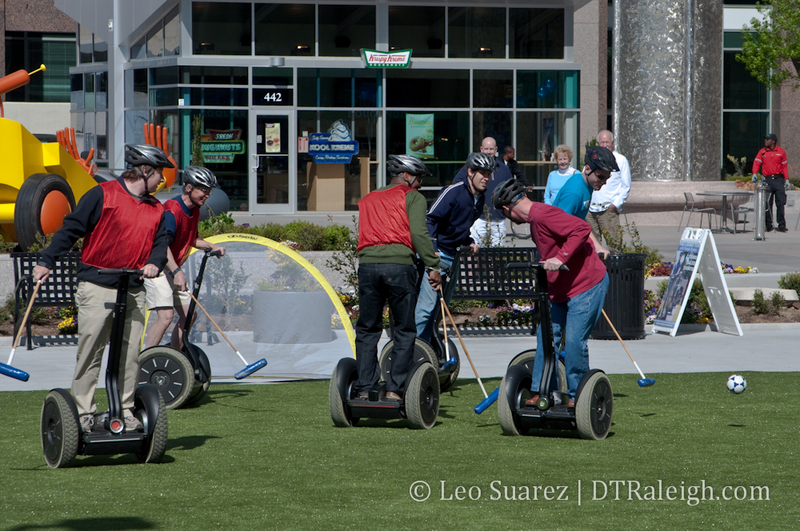 We asked a group of downtown Raleigh Ambassadors if parking was allowed on the plaza and three of them had no idea and also don’t enforce it. I may be making this a bigger deal then it is but if cars start to park on City Plaza, in my opinion, we have ruined the intent of the entire project. Now maybe this is a different case because it is a Saturday with slow traffic and no enforcement so why not let a few people park here, right? The work week is much busier and parking on all downtown streets are enforced so City Plaza is kept car free during those hours. I’m assuming this cause I still have not seen it for myself during a weekday. But for those that visit downtown on the weekends and are in town for a convention, why should their visit to the plaza be different? I’m romanticizing a little and imagine the plaza to be a gathering space for downtown visitors and residents without the parking lot severing the two sides from each other. Some may not mind it but it makes a stronger statement by the city that they back the Livable Streets policy they wanted for Fayetteville Street by prohibiting parking on this block and making pedestrians come first. It may be too early to really criticize as the plaza is still brand spanking new. Either way, I’ll take notice as to how people use the plaza, in and out of their cars. 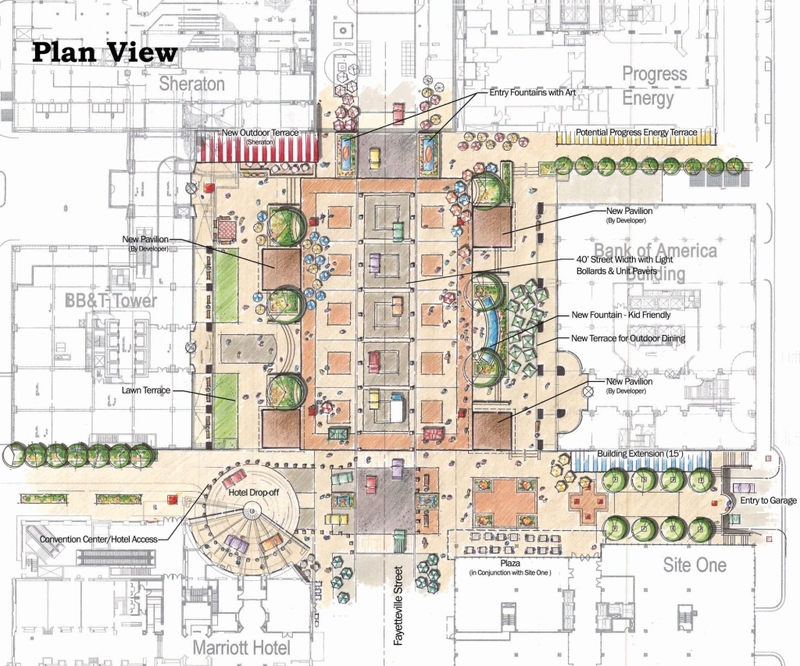 The area plan calls for forty feet between the row of bollards separating the pedestrian area and the street for cars. This is plenty of space for two way traffic and parallel parking on each side. Was this done on purpose? This may be too much room for a through street. Click for a larger view. 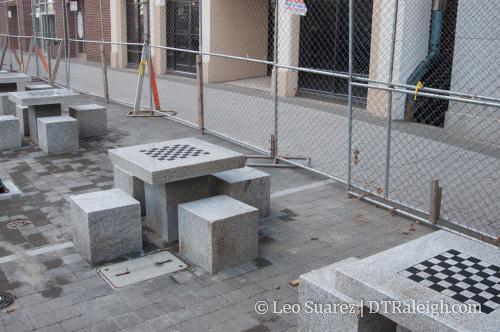 Six chess tables will be on the sidewalks of Fayetteville Street near City Plaza. This is not the first time tables have been on the street. The light towers of City Plaza. Click image for larger version.